Still not entirely sure about the categories for this site, so I'm gonna YOLO here and assume this is the right one for this type of thing. For anyone who's been reading The Messanger of Time, the next chapter is slowly but steadily progressing. So I estimate it should be posted within the next week. Anyway, to the subject this is all about. To those who know of the series of stories I've been working on, some of this may seem familiar. To others, I'll explain in detail. I've created my own pokemon (fakemon) who will show up near the end of Phase Two and in Phase Three. It is a fox-like pokemon with draconic properties, called Luothina. The one who is set to appear as a major character later in the series is named Eifthes Sorulensa, and he will play a large role as the protagonist's support. The species comes from Liathear, one of the many realms to appear in the series. I won't give many details now, to avoid spoilers (even though the later stories are a ways from being written). But I will show the images and references I've had put together for Luothina. The images may be too large to properly display in the forums on most monitors. Just right-click them view image to see them in full. The art of Luothina was drawn by NightTwilightWolf on deviantART, and the reference sheet and crest were done by myself. I'm posting this here to make this species public and to get others' opinions on it. If anyone has any questions, go ahead and ask and I'll do my best to answer without giving any details sensitive to the story itself. A full details sheet can be found here, with extra pictures and more on its signature move, Ebonbane. For those who were following this thread, I've added a full details sheet to my site, which can be found in the link on the first post here, or by going to my site linked in my signature and checking the Original Pokemon link on the right. It looks like it might be related to a griffin or Latios. 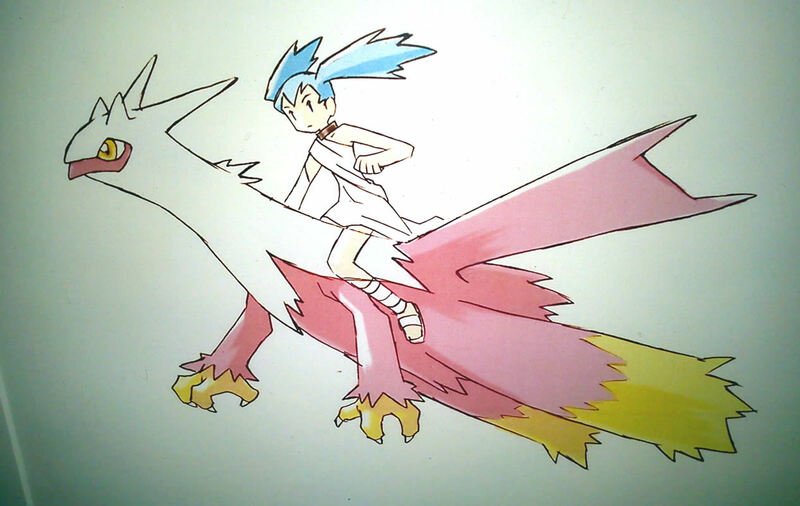 Of course, Latios, Latias and Blaziken used to be one Pokemon.